How do I help my 8 week old be comfortable in the car capsule? When ever I put her in the capsule and drive around she screams. She's in the car quite alot because I need to do school drop off and pick up and then do a few after school activities with my older child. Nothing is quite as nerve-racking, distracting and off-putting as a baby who cries or screams continuously in the car. We have to use the car so much in our daily lives that you can’t really avoid doing so. 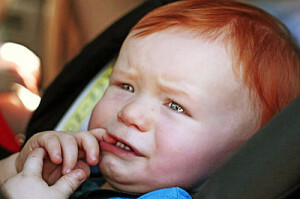 The reason as to why your baby cries needs to be thought through so you can solve the problem. Some of the reason why can be as follows – firstly that she is simply uncomfortable in the curved position, which can be due from a muscular problem. Bowen therapy can certainly help in this instance, its a very gentle, muscle technique and suitable for babies. Another reason is that more often than not when you have to be in the car at school drop off and pick up (8.30am & 2.30pm) and afterschool activities(late afternoon), coincides with your baby’s sleep time and your baby is simply overtired. The more overtired your baby is, the more they will scream, especially when instead of going to their bassinette/cot they are going out and about. This is more common with second or subsequent children as they get taken around to older sibling activities. If this is the case then put her down at 7.30am for a sleep and aim for a big lunchtime sleep at 12pm or earlier to help her cope. Also have somewhere she can sleep while at afterschool activities either pram, rug or a sling. Also consider silent reflux, which is when your babies stomach contents regurgitate up their windpipe a little and make them uncomfortable, you do not see any vomiting or reflux with this but crying when in this position or when lying flat is common. If your baby is happy when lying flat or in your arms at other times then this is not likely the cause. Lastly, perhaps it is because your baby can’t see you. If you hold your baby quite a lot of the time and she is used to being in your arms, then when you place her in the car seat and she is also facing away from you then all her cues of sleep are missing. Your smell, warmth, heart beat, touch etc. If she normally cries when you put her down at other times of the day then this is likely to be the cause. She thinks that she cannot cope without you. If this is the case, then put her down more often at home, she is fine, and she will be ok, and she will enjoy being in your arms but also play contentedly on her own.